London Days: Nonni and Sandie's First kit! Nonni and I decided to do a little kit club with just the 2 of us. Nonni recently sent me a kit full of amazing goodies. I had a lot of fun playing with all this pack and made quite a few cards. It is great to stretch your creativity using crafting goodies you don't have. Today we are sharing 2 cards with you. I used these stunning gold embossed flowers colouring one with copics to match the 'Hello' panel. The coloured one is popped up on foam pads for dimension. I just added some enamel gold dots to match the gold embossing. I do love how this turned out. I will enter this into the sketch at Less is More-I just moved the sentiment-see sketch at the bottom of this post. We will be back another with a few more cards from the pack. Brilliant cards, Sandie! I love them both. Great job hon! 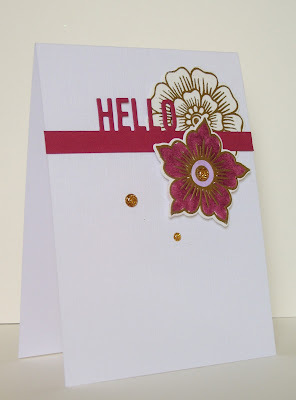 I think the gold embossed flowers look fab with the ruby red sentiment and coloring one of the flowers was a great idea to tie the card design together. You know how much I love tag cards so the second card is perfect for my eyes! That flower looks so cute on the tag and I love the color combo, very fresh. What a great idea and two fabulous cards as a result, well four actually as I've been over to Nonni's blog to see hers. As always you attention to detail and style is fabulous. These are both so cute, Sandie! What a fun idea to do a kit with your friend! Two great cards and very creative designs - love the pops of colour on both. Two absolute beauties Sandie! Those gold flowers...swooning!! Beautiful pair of cards....what a fun kit club you two are! So sweet. Beautiful card. Terrific take on the sketch. Thanks for sharing at Less is More! Fabulous cards from what looks like a wonderful kit by Nonni. Love that rich red and a great take on our sketch. And the bright yellow with the soft green looks fantastic together. Oh, your first card is so striking with the beautiful flowers, Sandie!!!!! A wonderful CAS look!!!! ...I've got those stamps ...might CASE you on this one!!!! 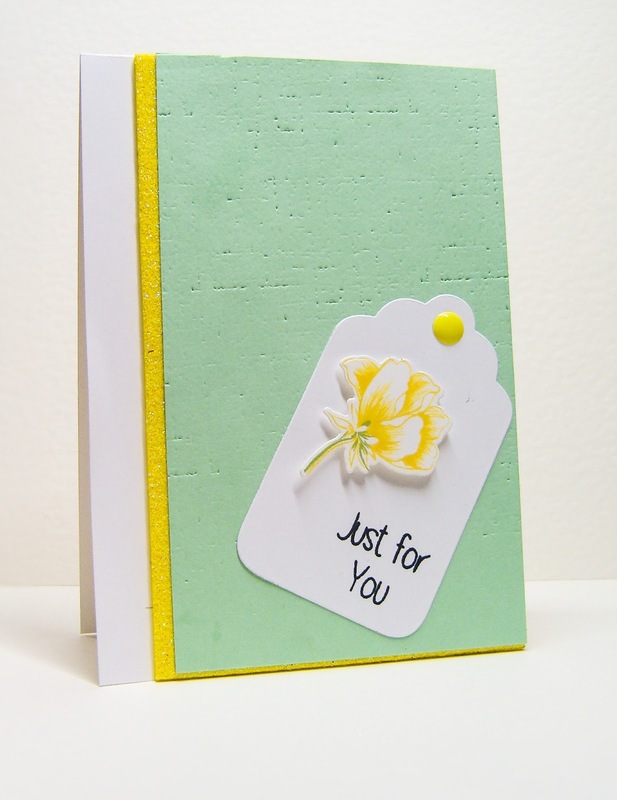 Love the soft green and yellow on the second card - for sure a lovely spring look with the lovely little flower!!!! Love both these beauties a LOT, my friend!!! 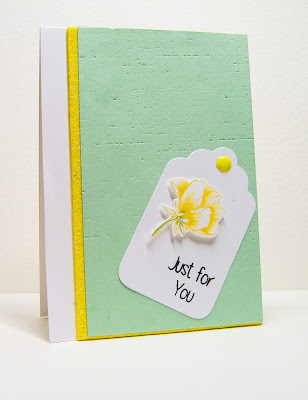 Pretty cards Sandie - what a great idea to do a kit together. Love the yellow and green together...so pretty! Love both of these cards, and how fun that you are trading kits with Nonni. Its such a great way to stretch your supplies.